Also, in the Daily Telegraph yesterday, they did a great article of how sequins are the thing for this Autumn. 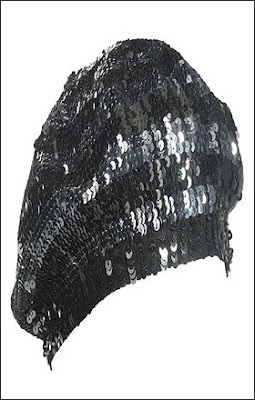 Alexander Wang, Balmain and Derek Lam are all designers who have also used sequins, or pailettes as they are also known. The gorgeous Kate at Make Do Style commented earlier how she'd seen a lovely sequin skirt by Pink Soda and this inspired me to see what else was out there from designers and the high street. So courtesey of the Daily Telegraph, here is some more of what is out and about this season! Click on my title to go directly to their article online too. Already purchased from Collier Row Boot Sale! Of course, there is also the delicious Patricia Field for Marks and Spencers sequin jumpsuit for £99 too-so a great choice to be had for either the Xmas season or dressed down with jeans for a cool day look! Your waistcoat is delicious! A good shopping once again. I enjoyed your London post too. I love that city! I've been TRYING to make people buy gold sequins for ages! these are all such great options! i particularly love the beret, since i've never seen anything quite like it. you've officially inspired me! At the moment, i'm in love with all things shiny. Great post! Funny that you did a sequin-themed post...I just saw a similar article and thought, "hey, maybe I can pull that off too" after reading this I definitely think I can. I really like the 20s inspiration of the Kate Moss dress and that blazer is really cute too. Hi tupersonalshopperviajero-thanks for your lovely comment my dear, London was a fab day out! Hi Wendy-I think I'll look out for a gold sequin piece on my future thrifting trips! 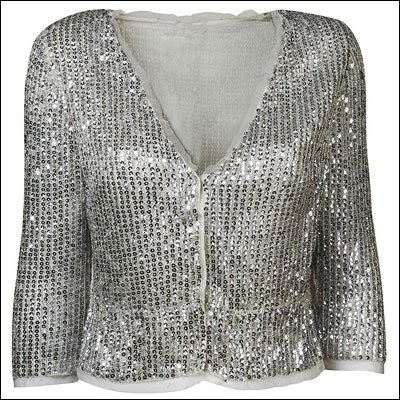 Hi emily-a sequin piece in your wardrobe is definitely worth having for Fall! Hi lil midget-thanks for your lovely comment! Hi always in style-Yes, really nice pieces here and I like how some pieces are dressed down, so you don't have to save them for that special occasion!! Hi ren-yes, very christmassy, haha! I'll be hitting the op shops myself this weekend, and sequins are on the list! Hi Sal-oh can't wait to see what you get!! p.s im craving the sequinned harem pants that were on ysl catwalks. I was just looking at that Kate Moss sequin dress about ten minutes ago! I'm looking for a new party dress seeing as party dress season is nearly here - it's so gorgeous!! I want!! Hi frugal-yes, they are really gorgeous, its a great investment buy I think! i like the first dress. i am not a big sequin person but one or two pieces in the wardrobe is quite savvy, i think. Hi savvy-yes, when I go thrifting next, I'll be keeping my eyes open for another piece! Sequins are tops aren't they! I love those jeans you selected too!! Hi Kate-oh yes, I'd have those jeans like a shot!! 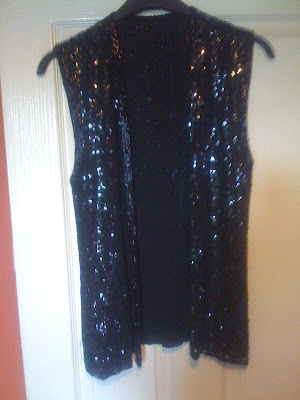 Have been looking for something with sequins for a while now. But dresses and jackets don't work for me. Your vest is excellent. Great find. I can already tell you're going to look awesome in that sequinned vest! oh my goooodddd I DIE over that first dress. I need it, like, asap. i'm on a sequin high as of now; i love that beanie...and that vest...and that dress! i want it all! I had to explain to my friend what sequins were. I loove the fist dress and silver jacket. Are those sequined pants because those could convince me that pants are good? Hi dana-yes, I'm soo pleased with it too, thanks! Hi lenya-thanks a lot and thats the same as me-I'd rather a waistcoat or bolero or even skinny jeans!! Hi a cat of impossible colour-thanks so much my dear! Hi winnie-oh thanks a lot and go for it my dear! Hi s-yes, totally gorgeous, I agree! Hi lacouturiernyc-haha, I know what you mean, thanks for stopping by! Hi jess-yep, they are sequin jeans, so gorgeous too!! Happy Halloween! I'd be happy with that beret. Cool stuff. Thanks so much for reading. Kate MOss first dress is amazing! I am starting to think about my New Year's Eve dress.. I like the 20s style dress (the first one) other then that - everything else is okay. Hi ellies eric-happy halloween to you too! Hi atelier-yes, it is a special one!! Hi budget chic-thanks for stopping by. Hi angelgrotton-it is!! happy halloween to you too my dear! Hi fashion chalet-yes, a fave of mine too! have a great weekend my dear! I *love* the flapper feel of that first dress. Hi ambika-yes, it does have that feel to it! 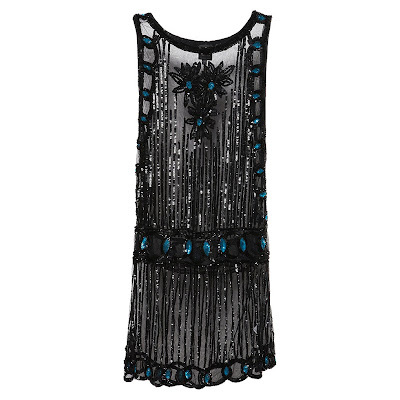 The sequin flapper dress is divine! I can't get enough of sequins, seriously. Happy Halloween, by the way! Hi tara-yes, its a very popular choice!! Happy halloween to you too! Sequins rock! I love that Kate Moss tabard dress ... very 1920s! Hi anchibride-I so agree my dear, love this too!